As occasionally happens, an OS X update designed to eradicate bugs allowed an entirely new bug to sneak in. This is what happened with Mac OS X 10.6.7. The symptom is this: the display and printing of text can be “jumbled” to the point of being completely unreadable. The problem does not occur in Mac OS X 10.6.6. I first became aware of this issue while surfing Apple’s Discussions boards (especially this thread). I mentioned it in the comments to last week’s column. In the interim, this bug has been covered on several other Websites, most notably TidBITS (which has a good discussion of the origin of the bug). The problem only occurs if you are using OpenType PostScript fonts. As far as I can tell, Mac OS X does not install any such PostScript fonts. You are likely to have them, however, if you’ve installed certain third-party software, especially Adobe applications. You can find out exactly which of your fonts are OpenType PostScript by launching FontBook and entering OpenType PostScript in the Search box. The problem primarily occurs with PDF files—especially PDF files you create in Mac OS X 10.6.7, such as via the “Save as PDF…” command in almost any application. The bug only crops up in certain applications. The TidBITS article noted that it happens only in “applications that rely on Mac OS X’s mechanism for rendering fonts; programs like InDesign that have their own rendering engines are immune.” Surprisingly, the problem does not occur in Mac OS X’s own Preview application. You will see it, however, in Adobe Reader. Although I could not duplicate this, some readers report that a document can display correctly yet show an “invalidfont error” when printing. This happened even though the original document was not a PDF, such as when printing from Word or Pages. I’m guessing here, but this may be a function of the specific printer. 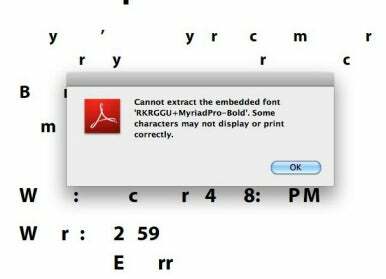 In general, before you can be affected by this bug, you have to use one of a subset of fonts (OpenType PostScript), work with certain types of files (mainly PDFs), and use specific applications (such as Adobe Reader). That’s why I say that many users will never confront this symptom. Update: In last week’s column, I noted another new bug in Mac OS X 10.6.7: iTunes crashing on 13” MacBook Air laptops. Apple has now issued a fix: Mac OS X v10.6.7 Supplemental Update for 13” MacBook Air (Late 2010). In case you’re wondering, the update makes modifications to just two System extensions: AppleUpstreamUserClient.kext and AudioAUUC.kext.